I've needed some dedicated storage for my VMware farm for quite some time. I have 4TB on my VMware server right now and it has a whopping 20GB of free space. The file server VM is also down to about 20GB of free space, and I'm tearing up a few terabytes of storage on the Bobulator for "overflow" stuff that won't fit on the file server. Today, I finally bit the bullet and purchased a dedicated storage appliance that will give me plenty of room for growth for the next few years. I did a lot of research into various small/medium business storage appliances and finally decided on the Synology DiskStation DS1812+. 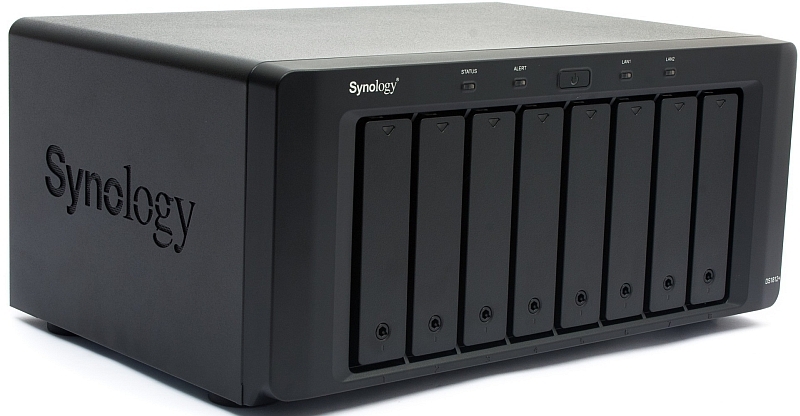 The 1812+ holds up to eight drives and supports 4TB hard disks, offering a raw capacity of 32TB. It can also be expanded with up to two additional 5-bay enclosures for a total of 18 disks, or 72TB with 4TB drives. Since 4TB hard drives with RAID support are ridiculously expensive, I'm going to start out with four 2TB drives I have laying around from another storage project I worked on last summer. I'll buy four more 4TB drives in a couple weeks, then an additional four to replace the initial set in a few more weeks. I think 32TB should last me quite awhile, so I'll hold off on purchasing expansion bays until I start running low on space. This is a dedicated gigabit switch that will be used solely for storage traffic, thus keeping it segregated physically from the rest of the network. I'll take some pics when everything shows up later this week.